Searing. Explosive. Lyrical. Compassionate. Here is the astonishing new novel by the Man Booker Prize–winning author of The White Tiger, a book that took rage and anger at injustice and turned it into a thrilling murder story. Now, with the same fearlessness and insight, Aravind Adiga broadens his canvas to give us a riveting story of money and power, luxury and deprivation, set in the booming city of Mumbai. At the heart of this novel are two equally compelling men, poised for a showdown. Real estate developer Dharmen Shah rose from nothing to create an empire and hopes to seal his legacy with a building named the Shanghai, which promises to be one of the city’s most elite addresses. Larger-than-life Shah is a dangerous man to refuse. But he meets his match in a retired schoolteacher called Masterji. Shah offers Masterji and his neighbors—the residents of Vishram Society’s Tower A, a once respectable, now crumbling apartment building on whose site Shah’s luxury high-rise would be built—a generous buyout. They can’t believe their good fortune. Except, that is, for Masterji, who refuses to abandon the building he has long called home. As the demolition deadline looms, desires mount; neighbors become enemies, and acquaintances turn into conspirators who risk losing their humanity to score their payday. Here is a richly told, suspense-fueled story of ordinary people pushed to their limits in a place that knows none: the new India as only Aravind Adiga could explore—and expose—it. 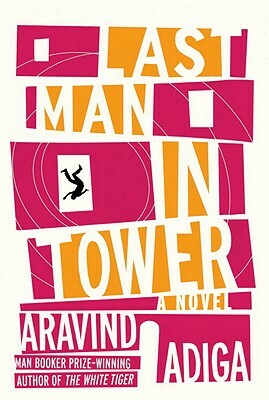 Vivid, visceral, told with both humor and poignancy, Last Man in Tower is his most stunning work yet. Aravind Adigais the author of "The White Tiger, "which was awarded the 2008 Man Booker Prize, ""and a collection of stories, "Between the Assassinations. "He was born in India and attended Columbia and Oxford universities. He is a former correspondent for "Time" magazine whose work has also appeared in "The""New Yorker," "Granta," "The Sunday Times" (London), and the" Financial Times, "among other publications. ""He lives in India. “Adiga, author of the highly acclaimed White Tiger, returns with this morality tale about events at a respectable, solidly middle-class building in Mumbai. The veneer of respectability and hard-earned bonhomie falls away after the residents—Hindu, Christian, and Muslim—are offered a windfall by an unscrupulous real estate developer who wants them to move. It is a credit to the author that the reader manages to keep straight the large cast of unforgettable and all-too-believable characters. . . . In the end, there are no heroes in this viper’s nest of competing desires and petty jealousies, as the residents’ uglier natures are gradually revealed in the face of their greed and disappointment. The swarming oceanfront metropolis of Mumbai, in various stages of development and decay, functions as a character in its own right. You won’t be able to look away as the novel hurtles toward its inevitable train wreck of a conclusion in this stunner from Adiga.